Every day, seniors are proving that dreams can come true, even if sometimes they’re just a little bit weird. One Ohio senior’s dream was to crash through a garage door, and with his family’s help, he did just that. 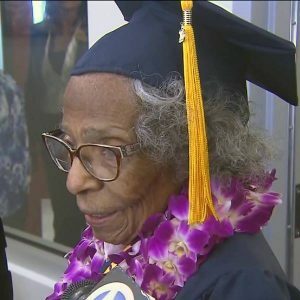 A 99-year-old California senior gritted her way through six years of college to graduate before the big 10-0, and last week she did, with her proud family looking on. And finally, Harriette Thompson ran her way through San Diego and into the record books again last week by finishing the San Diego Rock ‘n’ Roll marathon as the oldest woman ever to do so. Your loved one may have more modest dreams, or an even more eccentric one, but living an independent life is one dream most seniors share. With the help of a home care companion, your loved one can do it all. On May 31st this year, 90-year-old Walter Thomas crossed the last item off his bucket list. He also crossed off the only item on his bucket list. His dream was to drive a car through a garage door, and last Sunday, his family made that dream come true. Walter has had the yen to smash through his garage door for years, but until last week, managed to resist the temptation. But once he mentioned his secret impulse to his granddaughter, she made it happen for him. Walter put on a helmet, got behind the wheel of an SUV from the local salvage yard, and revved up inside a relative’s destined-to-be-demolished garage. With his grandson riding shotgun, Walter backed through the garage door, which was only a little bit pre-broken for safety, and into the afterglow. You can watch Walter’s very short trip and huge smile on YouTube. On Sunday, May 31st, Harriette Thompson ran into the record books when she completed San Diego’s Rock ‘n’ Roll Marathon at 92 years, 93 days old, becoming the oldest woman in the world to complete a marathon. Last June, Harriette completed the marathon at age 91, breaking a marathon time record for a nonagenarian woman by over 100 minutes. Since then, she suffered the loss of her husband to cancer, and the son that ran with her this year just began chemotherapy himself. Despite this, and overcoming a staph infection in her leg, this was Harriette’s 17th complete Rock’n’Roll Marathon. On top of all her other achievements, she raised over $90,000 for the Leukemia & Lymphoma Society as a Team In Training runner! If you had called Doreetha Daniels a six-year senior, but she would undoubtedly have taken it as a compliment. Last Friday, she graduated from College of the Canyons in Santa Clarita after 6 years of study, overcoming struggles with computer literacy, two strokes, and the loss of her driver’s license. At age 99, Doreetha achieved her goal of completing her degree before hitting the century mark. Her work ethic and tenacity were inspiring to her (much) younger classmates, but Doreetha’s own inspiration came from her grandchildren who are pursuing master’s degrees. Now she has an associate’s degree in social sciences, and serious bragging rights.